This is a stunning spacious well appointed semi-detached Quad Villa which sleeps 6. 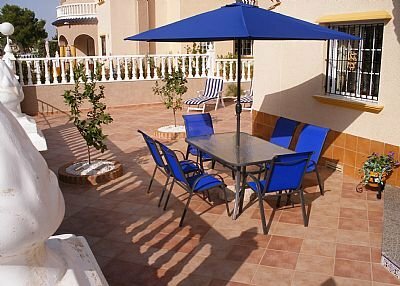 It is situated close to Alicante / Murcia Airports and is ideal for family holidays. The villa is finished to the highest specification and comprises of three bedrooms, two bathrooms, a large living room and kitchen. The villa also comes with a porch and two balconies together with a good size roof top solarium, perfect for sun-bathing. Going through the front door of the villa you enter a beautifully finished well appointed living area, on the ground floor is a twin bedroom, and a well equipped shower room, so if you have an elderly relative or two in your party there are no worries for them as they would not be required to climb any steps to enter the property or indeed any stairs to get to the kitchen, lounge, bedroom or shower room. This villa is non smoking, however if you do smoke ash trays are provided, but please smoke outside and not inside the property, for the comfort of others in your party and any guests arriving after you. Please dispose of any cigarette ends responsibility. There is of course hot and cold air conditioning in the lounge, the master bedroom and the two twin bedrooms a ceiling fan is also in each of the two twin bedrooms, two extra free standing fans are also provided for your use which may be placed anywhere in the property which suits you. On the first floor is the second twin bedroom, the bathroom is spacious and finished to a very high standard, in addition to having a full bath it also incorporates a shower. All towels are provided for your use in both the downstairs shower room and the upstairs bathroom. It would however be appreciated that you take your own towels to the pool area and not those provided for your use within the Villa. A hair dryer is provided in this property. Four chairs are provided for the inside dining table which is extendable to seat 6 using the addition of 2 of the chairs from outside if required. However due to the weather no one has ever needed to do this. Also on the first floor is the master bedroom, where like the two twin bedrooms has ample wardrobe space with coat hangers provided for your use. To keep secure your valuables, passports etc, a large safe is available for your use at no additional cost. A second door from the master bedroom leads out to a balcony area at the front of the property where you can also sit and relax. Up on the solarium there is a table and six chairs for your use. Within the storage area on the solarium is a second fridge, should you wish to store some additional liquid refreshment to keep it cool. A stainless steel basin with hot and cold water is also provided should heavily stained items of clothing require steeping. A clothes dryer is provided for use on the solarium for the smaller items or towels. There is plenty of outside space to relax with a large patio area that covers the front and side of the property, which gets the sun all day long from early morning to well into the late evening. Sun loungers are provided in order to top up your tan. A large patio table which seats six plus parasol is also provided allowing for summer-time barbecues and children playing. A rotary washing line is provided for your convenience for use in the garden area. This is an ideal property for adults or families who want a relaxing holiday. From the front door of the villa the pool is only a one minute walk and is open from 8am through to 9pm and caters for all ages, however, children must be accompanied by adults at all times to ensure safety, no glasses, glass bottles or alcohol are allowed on the poolside. The approach to the pool is all on flat ground and is for the exclusive use of the residents and their guests. Entry is accessed with the use of a key which is provided for you. There is a large grassed sunbathing area and shower facilities. Parking at this villa is convenient and available on the roadside. The local amenities – Things to do – Places to go. All of the following bars and restaurants, and supermarket are all within a 5 to 10 minute walk (just at the top of the road).Aldi’s is the local supermarket and is within an easy 5 minute walking distance. In front of Aldi supermarket is the Pub San Francisco. - There are a number of various types of bars here, some serving tapas one in particular The Street serves English food and Sunday lunches. The White Rose Cafe and tea rooms: Breakfast, snacks and afternoon cream teas. - A further 3 minute walk will bring you to the small commercial centre. Alfies Bar: with quiz nights, Karaoke nights and live entertainment at the weekend and bingo nights. They also have a Golf society.- The Auld Dubliner: Irish theme pub with food. Reasonable prices and Sunday lunches. – Hairdressers, Florist and Property shop. A new petrol station has been recently built at the top of the road three minutes away also a large Chinese store which sells just about everything. A new Commercial centre is due to be completed shortly and will consist of shops, restaurants and outside seating areas. It is a fact of life in Spain as with anywhere else that facilities change at various times, business’s sometime open for the summer season only and then disappear. The villa is close to the popular and lively Cabo Roig strip a 5 minute drive away. Here you will find many different bars and restaurants. There is truly something for everyone, from family bars with play areas to adult bars with popular local DJs that stay open until the early hours. There are also many different restaurants - Hungarian, Chinese and many more, so there is guaranteed to be something for everyone. Even the pickiest of eaters! Also nearby are the Championship Golf Courses of Las Ramblas, Campoamor and Villamartin. The cliffs at Cabo Roig. to the sandy beaches of Aguamarina. EU Blue Flag beaches, all just a few minutes apart by car, include Cala Capitan, Cala Caleta, Cala Bosque. The nearby EU Blue Flag beaches at Playa Flamenca and La Zenia, which have vast expanses of golden sands, there are jet-skis, a banana boat and pedalos in the summer months, as well as the usual "bars on the beach". There is also a Go Cart track at Playa Flamenca. There are a number of historic cities within an hours drive of Campoamor- Murcia, Cartagena, Orihuela, Elche and Alicante. Also La Manga and the Mar Menor are well worth a visit. Just a 5 minute drive from the villa, Cabo Roig Club lies next to the beach of Cala Capitan. The club has four hard courts, its own Swimming Pool, Bar and Restaurant. Qualified tennis coaching is also available. Take a ride in the Spanish countryside, within a 5 minute car ride is The Ranch at Campoamor. There is also Club Hipco near Villamartin, El Rancho at Los Montesinos. In addition to the lovely Capitan and Cabo Roig beach there are further beaches in Cabo Roig. The popular La Zenia beach is just around the headland. The Orihuela Costa has a massive 16km of coastline with coves of transparent waters and fine sand. Prestigious beaches such as Punta Prima, Playa Flamenca, Dehesa de Campoamor and Mil Palmeras, this areas beaches are awarded the Blue Flag year after year. If you are on holiday in Campoamor and interested in taking scuba diving course, you can do it in Playa Flamenca under the supervision of a PADI professionals. For advanced divers they have trips to several wrecks and the marine reserve. They also offer escorted dive trips from shore, boat diving and night diving. dro p off & collect from the villa. Find a quiet cove and fish off the rocks for as long as you like. Better still, go and meet the big guys - why not take a boat trip? Sophia Wellness Centre - Cabo Roig (behind Global Cars) - Swedish Body Massage, Aromatherapy, Indian Head Massage, Remedial & Sports Injury Massage, Reflexology, Reiki. with Scott Wood (MHFST MICHT FHT IIHHT). Call 695 343 152 or 966 775 718. This villa is non smoking, however if you do smoke ashtrays are provided, but please smoke outside and not inside the property, for the comfort of others in your party and any guests arriving after you. Please dispose of any cigarette ends responsibility. The communal pool has a childrens / toddler pool to be used with adult supervision.